14 Mercery Lane is a typical example of the many buildings recorded by the Canterbury Archaeological Trust. Its initial medieval form has been altered and changed so many times since the building was first constructed that only a small part of its original fabric still survives. Most of the visible fabric dates from the nineteenth and twentieth centuries, though a considerable amount of earlier timber framing still survives, buried within the walls of the present structure. A programme of renovation, undertaken during the spring and summer of 1992, enabled the Trust to survey the property. 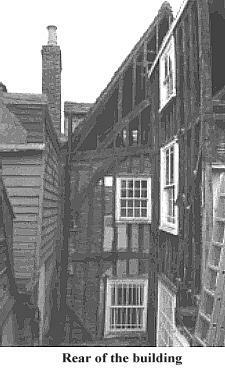 Although the repairs and alterations were limited, enough of the timber framing was exposed to provide a reasonable picture of the original medieval building which probably dates from the end of the fifteenth century. The timber frame, which rises to a height of three storeys, runs away from the street frontage. Only the first two bays survive, though a small amount of isolated fabric confirms the existence of a third. There is nothing to suggest whether the structure continued further to the rear. A crown-post roof, which may originally have been jettied and gabled towards the street frontage survives in part over the first two bays. Unfortunately, with the construction of a new facade and parapet, the roof now terminates in a hipped end. A garret floor was inserted into the roof space, probably a seventeenth-century modification, to provide additional storage or sleeping space. Rather surprisingly the two surviving tie-beams in this roof space continue beyond the north-east limit of the building for a further 12-18 inches. This unusual detail suggests that the property was either contemporary with or built against an existing building to the north-east. In either case a double pile roof with valley gutter has been formed at their juncture. No survey work has yet been undertaken on 15 Mercery Lane and it is not known whether any historic fabric survives here. Only the floor framing at first floor level was visible. All the floor joists in the first bay survive together with an intact sequence of carpenters marks, however no provision for stairs was observed. Later modifications, in particular the insertion of a brick chimney stack. have resulted in the loss of all but two of the joists in the second bay. The front bay at ground floor level, perhaps used for retail purposes, was separated from the second bay by a stud partition. Access to the rear of the property was afforded by doorway located at the south-west end of this partition. As with most of Canterbury's historic buildings, 14 Mercery Lane has not escaped the ubiquitous face-lift. The street frontage, which was originally jettied on both first and second floor levels has been cut back and replaced with a modern facade and parapet. Only the jetty at first floor level, now hidden behind later fabric, survives intact. One of the brackets below the first floor jetty appears to remain in situ. Apart from these details no further evidence survives to suggest what form the original medieval street frontage took. Rather ironically shallow timber planks have been applied to the facade of the building in an attempt to lend it a timber-framed appearance, a practice that has become increasingly common in the twentieth century. After nearly five hundred years, architectural fashion has finally come full circle! Click on the logo to see this place today. The information on this page is Copyright © Canterbury Archaeological Trust Ltd 1993. Reproduced with permission. The text and pictures were taken from Canterbury's Archaeology 1992/1993, The 17th Annual Report of Canterbury Archaeological Trust Ltd.